Ultra-Tech | Speed-O-Calibrator | Railroad Testing Equipment Welcome to Ultra-Tech Enterprises, a Railroad Testing Equipment Provider in Punta Gorda, Florida . 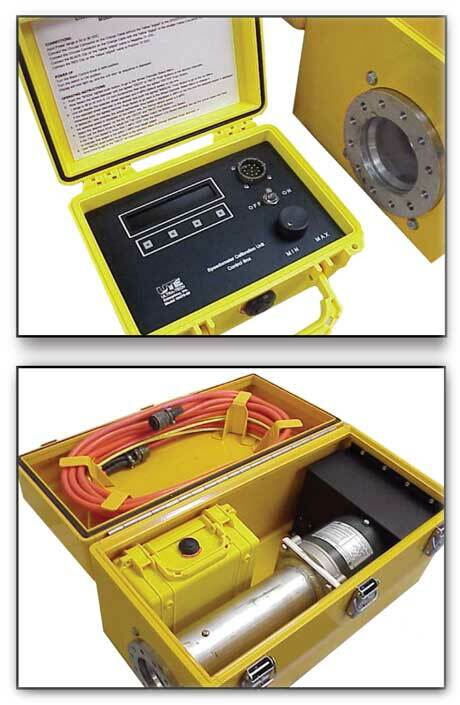 The Speed-O-Calibrator consists of two sections, control box and drive unit. The control box is stored inside the drive unit for easy portability. The control box weighs less than 6 lbs and is used in the cab of a locomotive to control the speed of the Axle Alternator Drive Unit. The Drive Unit drives the Axle Alternator at various speeds while the user verifies that the correct speed is displayed in the cab. The test system provides a complete test of the speedometer system, including all types and paddle lengths of Axle Alternators.